As temperatures drop and winds pick up, it’s easy to understand why raccoons, skunks, squirrels, bats, mice, and other small creatures are looking for safety and warmth. But, why, you may ask, must it be in your attic, chimney, or basement? Or, perhaps, someone’s decided to make the space under your porch or deck their winter home. If you want to know how to keep wildlife out this winter, this article is just what you’re searching for. You’ll find out where to look for the entrances these animals find into your home, pick up some prevention tips, and learn what to do if someone has already taken up residence. 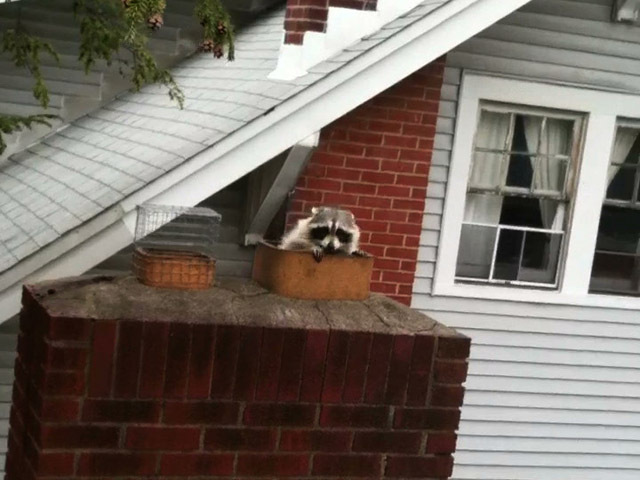 An uncapped chimney is an open invitation to a raccoon looking for winter digs. Wildlife will find and make use of what may seem impossibly small entry points, so you have to make a special effort to look for your home’s vulnerable spots. Grab a pair of binoculars and your camera or cell phone, so you can spot any entry points that are high up and document them for planning your repairs. Check out the trim or fascia boards—are they deteriorating? How about those attic vents—are there holes or tears in the screening? If you have a chimney, is it capped? Look around windows, dormers, and other points where building materials intersect. Then, check at ground level. Are there any small openings in the foundation? Look for openings around pipes, vents, or cables where they enter your home. For a mouse to gain entry, the hole can be as small as a quarter inch, so make a slow and careful search. Is someone already “home” in your home? If an animal has already taken up residence, you’ll need to proceed carefully when trying to remedy the situation to ensure that you don’t accidentally trap the animal inside. Not only would that be cruel but it would result in a bad outcome for you, as well. Damages can occur when an animal attempts to get out or when a mother attempts to get back in to rescue her babies. Yes, at almost any time of year there may be dependent young! Squirrels, for instance, have a second litter in fall. If animals are trapped and unable to chew or claw their way out, your home will have a terrible odor when they perish and their bodies begin to decompose—an ugly reminder of the death you unintentionally caused. So, be careful to ensure that no animals are inside before sealing up openings. The best way to check for animal presence is to loosely plug entry points with crumpled paper, or cloth. An animal still inside can easily push the material out of the way to exit. However, if no one moves the material for several days during normal (not severely cold or wet) weather, you can safely assume no animals are inside and make repairs. 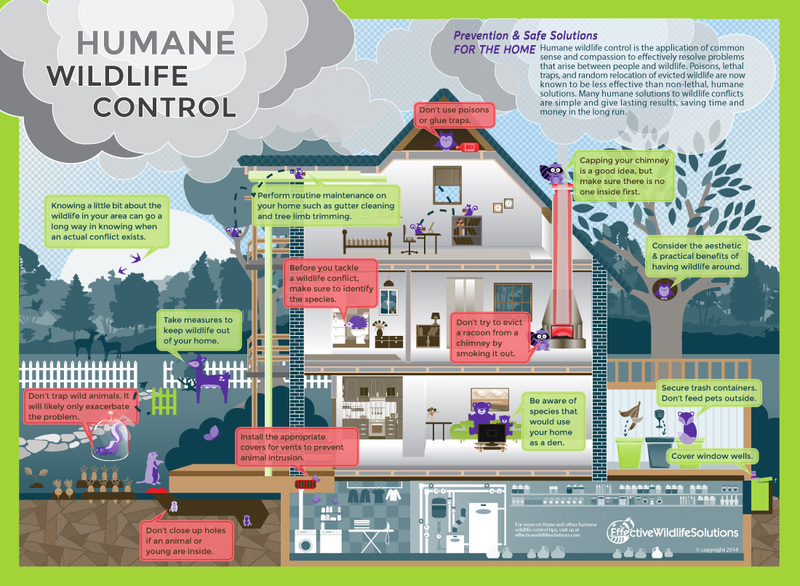 Check out this nifty infographic to see the areas in and around your home where animals may take up residence. Then read on to learn more about keeping wildlife out. Once you’re sure no animals are inside, you need to choose the right materials for sealing the entry points. If the opening is smaller than a few inches, you can plug it with a combination of caulking and/or expandable foam and copper mesh (or other metal mesh material) that will prevent animals from chewing in as well as making things weather-tight. If the opening is larger, you’ll want to repair it with metal flashing, hardware cloth, or original building materials. If you opt for hardware cloth, use a 16-gauge 1”x 1” mesh. If you’re dealing with squirrels, you may do best with aluminum flashing coil or its equivalent. When capping a chimney, it is often best to hire a professional. Whoever performs the work should check for animals inside the chimney first by inspecting the flue from both the top and the bottom with a flashlight. 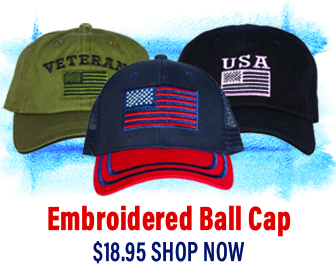 Choose a sturdy cap that meets NFPA code, and follow all instructions from the manufacturer. 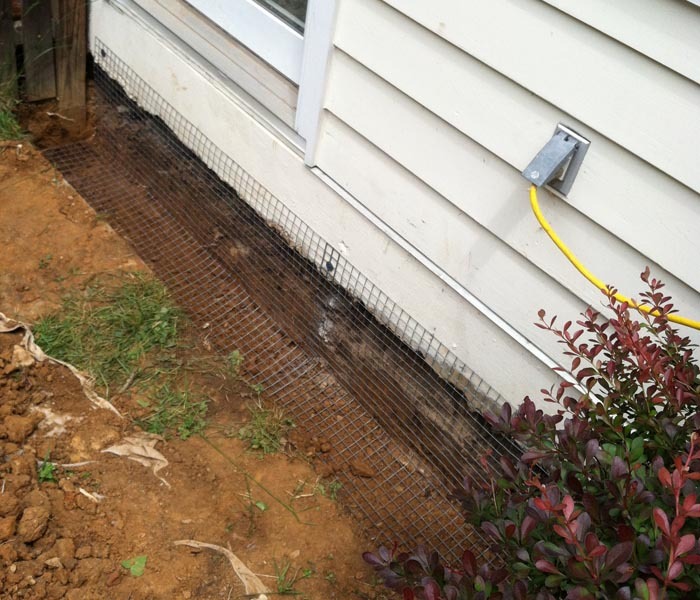 Burrowing animals may take an interest in the space beneath your porch, deck, or shed. If they’re not causing any difficulties, leave them be. In any case, don’t try to evict them or seal up the space if winter is already in full swing. If it’s still early in the season and they are active, try harassing them to get them to move along. They like dark quiet places so shine light into the space and play a portable radio beside it. Use the method described above to loosely block the entrance so you can assess when they have left and not returned. Then close off access to the space by installing an “L-footer” made of 16-gauge hardware cloth. Once you’ve secured your home for the winter, you’ll have peace of mind. It’s also better for the animals to know from the outset that they need to look elsewhere for winter digs. When you periodically inspect your home or perform spring and fall cleanup it’s not just about keeping animals out—this effort also goes hand in hand with making sure your home is weather-tight. Periodic inspections not only help you prevent animal intrusions, but they also help you avoid large repair bills from longstanding problems that let weather in or deterioration continue. 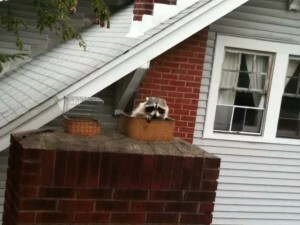 Take a careful look at your home’s exterior from the perspective of the animals that might use it. Assess it from roofline to foundation, to see if any new repairs are needed. Baby season will be just around the corner, and expectant wildlife moms may be examining your home as a possible place to raise their young. Warm, safe, dry… these are the things they naturally look for, so it’s easy to see why they find our homes appealing. Just keep your home in good repair, and you can enjoy wildlife’s presence in your yard and community. Maintaining your home during the season changes is a really good idea. Like you mentioned, not only does maintaining your home keep unwanted animals out but it helps with the efficiency of the home. In addition to doing a visual inspection, it may help to listen to walls for sounds of pests. Exactly! Thanks for the feedback.